With the elimination of Kathleen Waterhouse in 10th the final nine players began to discuss a deal. The chips were counted down and there were plenty of negotiations. 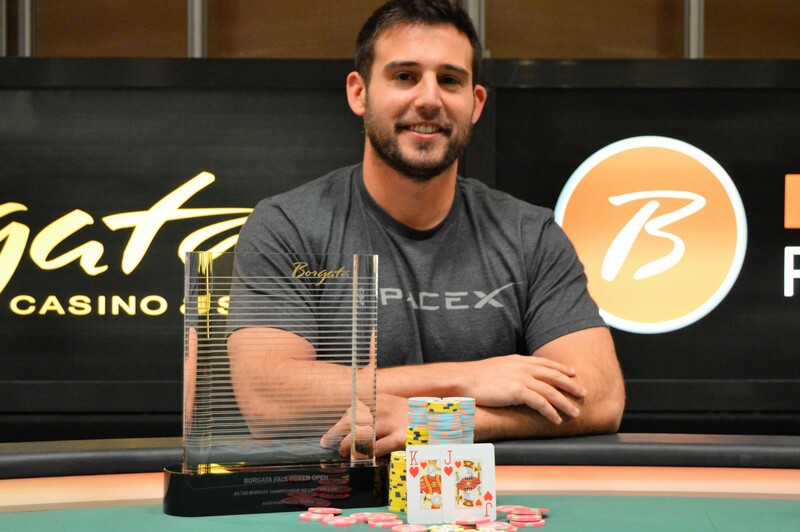 It took some time but they finally agreed to a deal and although Nick Dudi was holding a slight chip lead he agreed to let Zhaoxing Wang take home his fourth Borgata Poker Open Trophy. Below is a look at the chip stacks at the time of the deal and what each player will be earning. Although she started the final second in chips Kathleen Waterhouse doubled up Brent Tarantino holding against his in one of the first hands. Just a few hands later Nick Dudi raised to 200,000 from under the gun and Brent Tarantino called from the cutoff. Waterhouse moved all in for 840,000 and with the action back on Dudi he re-shoved all in for about 1,400,000. Tarantino quickly folded and the hands were revealed. The dealer fanned the flop and Dudi picked up a flush draw. The turn improved Dudi to the nut flush and Waterhouse was drawing dead. The hit the river and Waterhouse was the first final table elimination earning $1,695. The final Table of Event 14 the Saturday Series Deep Stack NLH event is now set. Zhaoxing Wang is the chip leader with 2,040,000 and is the only player over two million. After being part of a deal in this very event last week to earn over $11,000 Wang is closing in on his fourth Borgata Poker Open title. Kathleen Waterhouse is next biggest stack with 1,500,000 and Nick Dudi is the only other player over a million with 1,330,000. The final table will battle it out into the early morning hours until we have our newest Borgata Fall Poker Open Champion. That lucky winner will be taking home the $35,198 first prize along with the BFPO trophy. Below is a full list of updated chip counts and final table seating assignments. We catch up to the preflop action and see Nick Dudi all in for 191,000. Michael Dobbs and Brent Tarantino call and they see a flop of and Dobbs moves all in for about 400,000. Tarantino makes the call and the hands are shown. The and complete the board and Dudi’s queens hold up to earn him the main pot. Tarantino scoops the massive side pot to move into the chip lead and Dobbs who held the lead just moments ago hits the rail. The action folds to the player in the hi-jack position and he limps in. The player in the cutoff moves all in 126,000 and Shawn Maloney calls from the button. Maloney has his opponent dominated and puts a hammerlock on the hand pairing his ace on the flop. The turn leaves his opponent drawing dead and the meaningless completes the board. Maloney sends his opponent to the rail and we are now down to the final two Saturday Series tables. The Saturday Series players are now on a 15 minute color up break. We are down to the final 29 and they will continue to battle it out in the Signature Room for the $35,198 first prize and the BSPO trophy. We will pick back up on all of the live Event 14 action when play resumes. Just 30 players remain in the Saturday Series and Shawn Maloney is leading the way with 800,000. Frank Reina is closing in on 700,000 and has already added his 67th Borgata tournament cash to his resume here tonight. Duan Haughton is right behind Reina with 650,000 and the two are now sharing the felt on Table 4. The action folds to Mark O. in the cutoff and he moves all in for 45,000. Frank Reina calls from the button and the blinds quickly fold. The dealer fans the flop and it’s no help to Mark but he pairs his ace to take the lead when the hits the turn. The river card is no help to Reina and our Event 5 Champion Mark O. doubles up. The Event 14 money bubble was lightning fast last just three hands and it was Brent Tarantino scoring the knockout. Tarantino’s improved to the nut flush on the river and a player holding top pair of aces was sent to the rail. The remaining 36 Event 14 Saturday Series players are now all in the money and guaranteed at least $808. Play will continue until we crown our newest BFPO Champion in just a matter of hours.